Bach, J.S., 271 Chorales, Schirmer Edition. Haydn, Joseph, Complete Sonatas and for Solo Piano (2 vols. ), Dover Edition. Benjamin, Horvit, Nelson, Music for Sightsinging, (Wadsworth), 2000, 3rd. Edition (referred to as SS). All assignments (labelled SS) in prepared sightsinging come from this book. Brings, et al, A New Approach to Keyboard Harmony, (W.W. Norton), 1979 (referred to as KB). Available from Course Reader Mats., 1137 Westwood Blvd. The last three books will have assignments announced by the TA throughout the next two quarters. There is graded dictation at the beginning of each class: any student who misses a dictation will earn a zero, which cannot be made up. There will be six written assignments in four-part harmony, and they are due on the days indicated. Any late assignment will be downgraded: since papers will have numbers (e.g. "0" is no mistakes and an "A") a number will be added for each class day late. Papers with the grade of "X" must be rewritten and submitted at the next class. Monday, January 6: Introduction to the course. 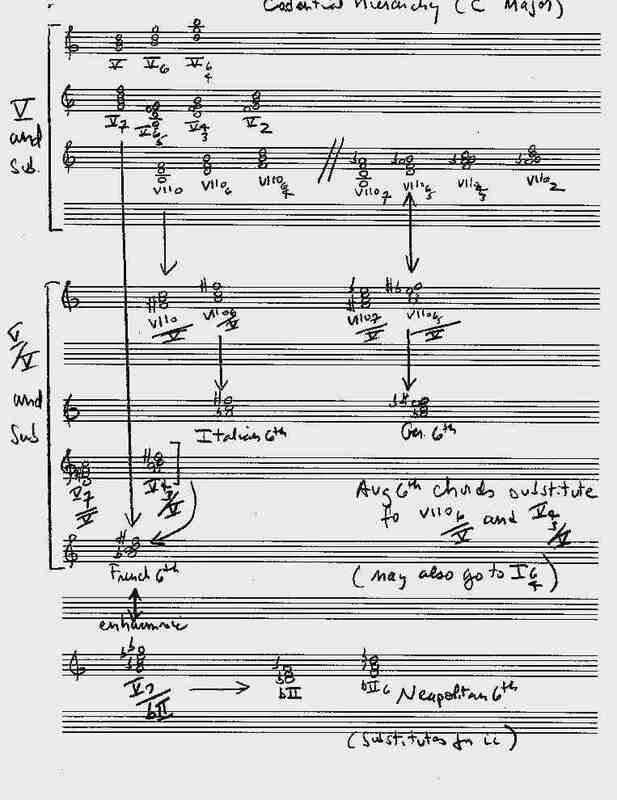 The matrix of tonality as a hierarchy (click on introductory lecture below). T, Jan. 7: Review nad drill. The importance of repertoire: why remember the themes of great works? Setup for audition of major ideas of Beethoven's symphonies. W, Jan. 8: Triads and their inversions. Read Introduction to Tonality in the Course Reader (PP. 1-3). Th, Jan. 9: two-hour drill of triads and inversions. new groups should be formed at this time. M, Jan. 13: Read Toward 24 Keys in the Course Reader (PP. 5-14). T, Jan 14: More drill on triads. play one note and add a fifth above, then third. Do the same with the other two inversions. KB prepare Exercise 1.14, PP. 10-11 (Brings). Play in the keys of G and F also. SS prepare rhythm PP. 78-80, melodies PP. 86-87. Drill at sight PP. 83-85 and duets P. 81. W, Jan 15: The basic diatonic system. Read Brings PP. 78-81 for information on figured bass numbers. Th, Jan. 16: SS prepare PP.88-90 and drill duets, PP. 91-93 in class. T, Jan. 21: SS prepare melodies 1-4, PP. 100-101. Rhythm prepare PP. 95-97. Drill duets, PP. 97-98 in class. KB prepare Exercises 2.1 and 2.2, PP. 12-13. W, Jan. 22: predominants and substitutions. The deceptive cadence and the idea of temporary tonicization. Read Rameau, Chapter VI in the Course Reader (PP. 21-26). Th, Jan. 23: SS at sight (group) PP. 102-106. KB prepare exercises 2.4, 2.5, 2.6, PP. 14.15. Drill 2.7 in class. M, Jan. 27: secondary dominants and the diminished seventh chord. Read Harmonic Progression in the Major Mode in the Course Reader, PP. 27-37. T, Jan. 28: SS at sight (group) PP. 107-112. KB prepare exercises 2.8 and 2.9. Also play in the key of C.
W, Jan. 29: interaction of the modes. Th, Feb. 1: SS drill PP. 117-118, prepare PP. 119-121. KB prepare exercises 2.12 and 2.13. Play also in the key of G.
M: Feb. 3: Harmony assignment # 2 due. T, Feb. 4: Dictation midterm. W, Feb. 5: Musicianship midterm. Th, Feb. 6: SS prepare PP. 122-123, drill duets PP. 124-125 at sight. KB prepare exercise 2.18, P. 18. Drill in class exercises 2.19 and 2.20. M, Feb. 10: Harmony midterm: In class analysis (bring an exam booklet). T, Feb. 11: Review of musicianship midterm. W, Feb. 12: Review of Harmony midterm. Th, Feb 13: Keyboard drill on figured bass from last chorales and altered chords. Chart of hierarchy of altered chords. M, Feb. 17: Presidents' Day (holiday). T, Feb. 18: SS at sight drill PP. 128-129, prepare PP. 131-132. KB prepare exercises 2.21, 2.22, 2.23. In addition, play all in the keys of C and D.
W, Feb. 19:modulation and extended tonicization. Introduction to Mozart and sonata form. Th, Feb. 20: SS drill PP. 142-143, prepare PP. 144-145. M, Feb. 24: altered chords, including neapolitan, augmented sixth, and borrowed chords. T, Feb. 25: SS prepare PP. 146-147, drill duets PP. 148-149. W, Feb. 26: Secondary dominants review. Th, Feb. 27: SS prepare PP. 160-161, drill PP. 156-157. KB prepare exercises 2.24, 2.25, 2.26, PP. 20-21 in keys of C, Bb, D, F, Eb. M, Mar. 3: Augmented sixth chords as pivots: pivot chords in general. T, Mar. 4: SS prepare PP. 162-163. KB prepare exercises 2.27, 2.28, 2.29. In addition play in two other keys of your choice. W, Mar. 5: Drill on modulations. Th, Mar. 6: SS prepare PP. 169-170. KB prepare exercise 2.30 in all keys. KB prepare exercise 10.1, P. 132 and 10.2, P. 133 for practice in alto clef. M, Mar. 10: Review modulations in sonata form and secondary dominants. T, Mar. 11: SS prepare PP. 171-173. KB prepare exercises 2.31, 2.31, 2.33, 2.34 in keys up to four sharps and flats. W, Mar. 12: General review and dictation drill. Th, Mar. 13: Keyboard harmony review and drill. 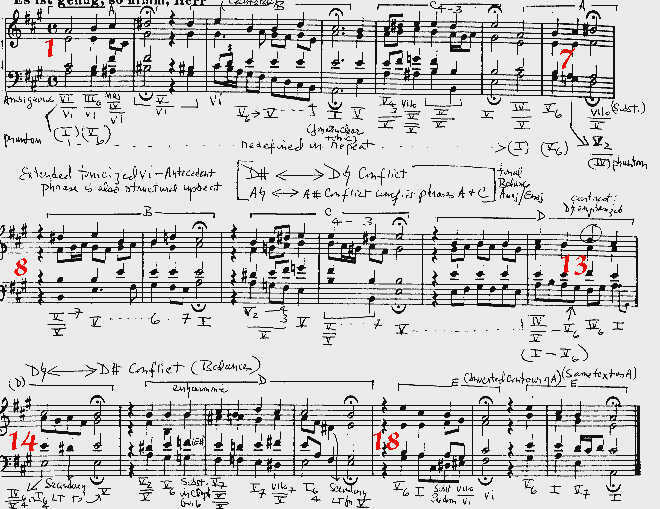 KB prepare exercises on P. 24 in at least four different keys. Drill in class. KB accelerated keyboard group: prepare exercise 10.3 in score reading. Analysis paper #2 due on the examination day. Sample analysis of a bach chorale (in Course Reader): The music of J.S. Bach's Es is Genug (with chord symbols and phrases marked). The analysis itself. This syllabus and all other materials are also available at http://www.minotaurz.com/minotaur under the heading of educational materials, subheading of syllabi. Students may seek help from the professor at the office hour, Wednesday 12:00-1:00 PM, by e-mail (p_reale@minotaurz.com), or by phone (dedicated line available until 8PM). In advance of due date, assignments may be faxed or sent as Finale or Sibelius attachments for approval (be sure to include .MUS or .sib file extensions). Harmony assignments involve four-part writing in Bach-Chorale style. Analysis paper #1 is a differential analysis of a Bach Chorale, while #2 is a Haydn Sonata movement (students may check 'First Movement Form: Sonata Principles" in Course Reader)..
Students would check this version for latest revisions.